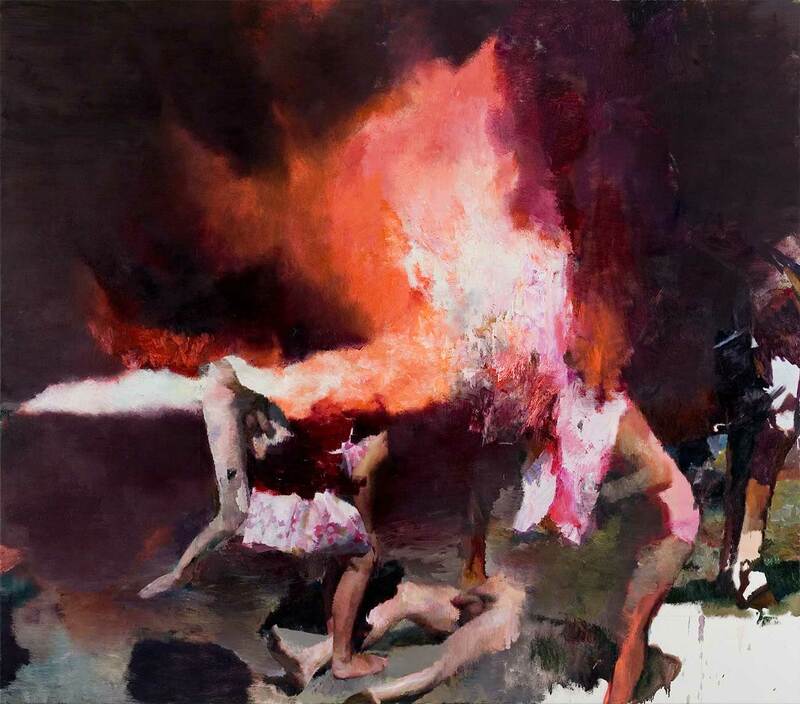 Justin Mortimer's darkly enigmatic paintings are infused with an unsettling disquietude. His heavily worked, technically adroit canvases depict sinister and foreboding landscapes, often populated by fragmented figures and lurking, truncated body parts. These ambiguous and eccentric narratives embody potent psychological states, addressing issues of alienation, ontological solitude and the fragility of the human body. 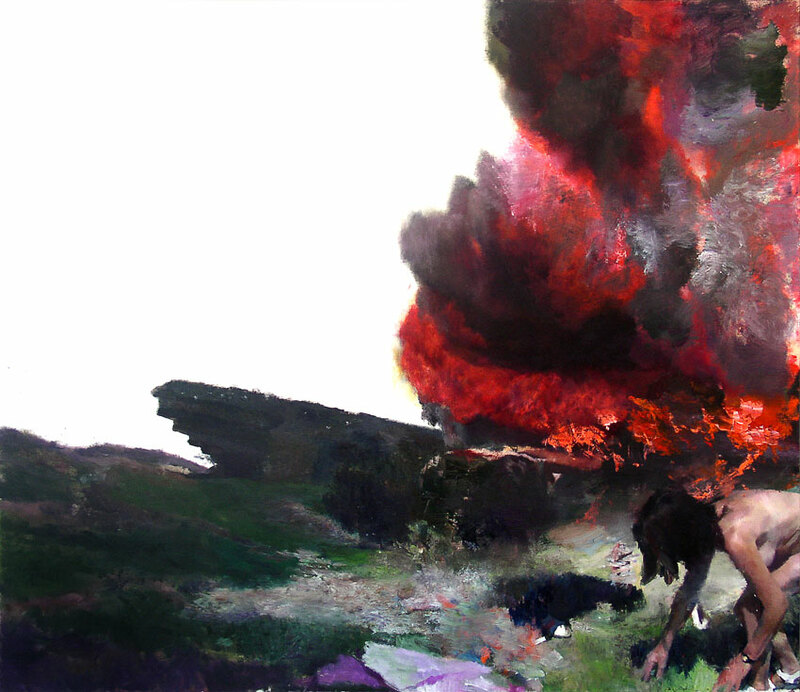 Locations that have borne witness to conflict, or moments of extreme human vulnerability are Mortimer's primary inspiration; images of battle sites, derelict wastelands, military graveyards and other places of heightened emotion provide the starting points from which his extraordinary paintings evolve. However, before pigment touches canvas, each work is prefaced by a digital collage – a working drawing composed in Photoshop, built from the artist's extensive archive of imagery. Holiday snaps, photographs torn from magazines, found medical photographs and internet-scavenged images all find their way into these primary montages, which are created rapidly and spontaneously. Yet Mortimer has no interest in critiquing the role of digital imaging in the construction of private and public memory, rather the procedure is a pragmatic shorthand intended to expedite the creative process. These digital sketches are then transposed to the canvas, after which the physical painting process takes over until, returning to his computer, more collages are created to aid the advancing composition. As the canvas is repeatedly overpainted and redrafted, this to-ing and fro-ing between digital and analogue can often result in up to fifteen collages being created for a single painting. It's an unconventional approach, yet draws out unanticipated visual collisions that amplify Mortimer's underlying themes and emotive content.